Mass A is initially moving with a velocity of 2 m/s in the +x-direction. Mass B is initially moving with a velocity of 6 m/s in the –x-direction. The two objects have equal masses. After they collide, mass A moves with a speed of 4 m/s in the –x-direction. 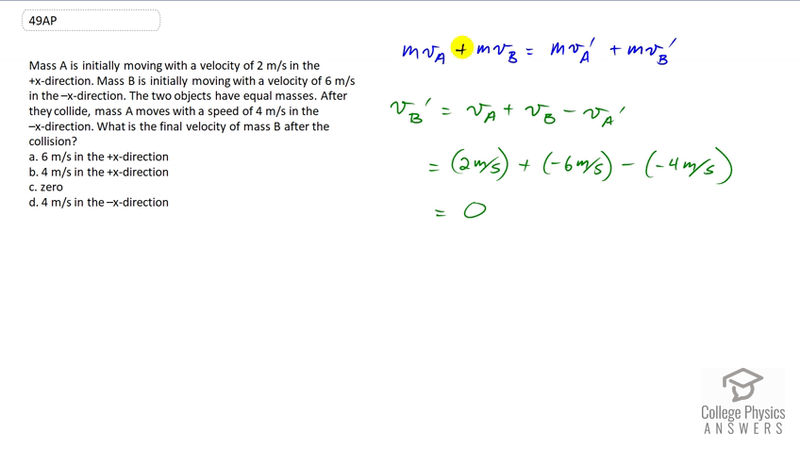 What is the final velocity of mass B after the collision? This is College Physics Answers with Shaun Dychko. The conservation of momentum means that the total momentum initially is the same as the total momentum after collision. So we have m vA plus m vB total momentum before the collision, equals m vA prime plus m vB prime, total momentum after the collision. I did not write a subscript on the letter m because we're told that the objects have equal masses and so it's a common factor as it turns out and so it cancels everywhere after you divide both sides by m. Also we can move this vA prime term to the left by subtracting vA prime from both sides. We get vB prime, the velocity of mass B after the collision, is velocity of mass A before the collision, plus the velocity of mass B before the collision, minus velocity of mass A after the collision. So that's two meters per second plus negative six meters per second because we're told mass B is moving in the negative x direction, and then minus negative four meters per second because mass A is also moving in the negative x direction after the collision. So that's two plus negative six is negative four, and then minus negative four makes zero. So the answer is C.